was ordained as Bishop by Praise Covenant Interdenominational Fellowship (PCIF), an affiliation of independent, Bible-based churches on the East Coast of the United States. He serves 12 PCIF churches in Virginia. Bishop Thomas was born in inner city Baltimore to a mother who suffered from MS, an absent father, and a grandmother who made sure he spent most of his childhood in church. He gave his life completely to God late in high school, and spent several years touring the Mid-Atlantic region preaching and performing with a gospel band. In 1999 he gave up a successful career as telecom account executive at Bell Atlantic to become full time pastor of Highview Christian Fellowship, which is currently located in Fairfax, Virginia. Bishop Thomas earned a Bachelors degrees in Biblical Studies and Biblical Counseling from Washington Bible College in Lanham, Maryland, and The Christian College Seminary in Independence, Missouri, where he also completed the Masters of Divinity degree. 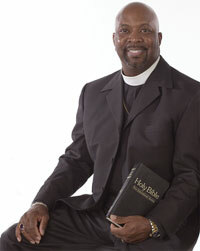 He received a Doctoral degree from Florida's Jacksonville Theological Seminary in 2008. He has traveled and done ministry work in Africa and India. He and his wife Cindy have three grown children and three grandchildren. is a freelance communications consultant and trainer in Arlington, Virginia. She has a lifelong interest in theology, communication skills, and the delicate balance between community and individuality. Her first job as a writer was for the U.S. Information Agency, "telling America's story to the world." Teri coordinates the Washington D.C. Meetup study group of philosopher Ken Wilber, and she is an occasional volunteer editor for the Journal of Transpersonal Psychology. She is a longtime member of the salon, "Abraham & Aristotle and all Their Children" run by Voice of America producer Judith Latham. Teri has an undergraduate degree in Communications and Public Policy from University of California at Berkeley and a Masters of Urban and Regional Planning from George Washington University. She was previously a board member of the Celebration Center of Religious Science in Falls Church, Virginia. Teri is married to textbook author Andy Murphy who shares her adventures in this book. Previously they co-authored "The Husband's Manual: A Guide for Husbands and Men Trying out for the Part." You'll find the remainder of Teri's spiritual biography in chapter 3.